Is the robot revolution arriving sooner — and with more devastating force — than you once believed? While much of the automation discussion has surrounded blue-collar careers in manufacturing and transportation, recent studies on the subject see a much wider range of jobs being affected. According to an algorithm developed in 2013 by researchers at Oxford University, 47 percent of U.S. jobs could be automated “in the next decade or two.” A more recent multinational study puts 210 million jobs in 32 countries at risk. But these numbers don’t show the full picture of the future of work. Now is not the time to panic; now is the time to take action to set your company up for the shifting landscape of work in a way that will protect your business and your most valuable employees. Relieving automation fears to some extent is the fact that not all studies agree on the potential for extreme disruption. One study shows that the actual number of jobs that could be fully automated is only around 5 percent. And while nearly all occupations could be affected by at least partial automation, this could actually benefit employees — provided they have adequate training to work with automation services. It may be that the biggest concern for workers is not that specific jobs may be automated tomorrow but that they lack the skill sets required for the jobs of today. In a recent McKinsey report, 40 percent of employers said their entry-level jobs were sitting unfilled due to a lack of requisite skills among applicants. Meanwhile, 60 percent of employers believed that recent graduates weren’t sufficiently prepared for the workforce. And while older employees may have more work experience under their belts, it’s likely their training in more technically complex skills is similarly inadequate. So, what does this mean for your own company and workers? To strengthen your team, you have to rethink not only your hiring practices but how you prepare your existing employees for automation disruption. Here are a few steps to get you started. Look for adaptability, not qualifications, in candidates. It’s time to consider factors other than education and past experience. They may act as indicators, but they aren’t great at predicting future success with your company. Constant upheaval in technology makes most college degrees outdated in short order. And with U.S. job markets only recently course-correcting after the 2008 recession, finding a candidate with five years of consistent experience in a single field is unlikely. Conversely, soft skills such as adaptability, cognitive and social intelligence, and personality will be much more indicative of a candidate’s potential to thrive on your team. According to Caitlin MacGregor, CEO and co-founder of Plume, you should “focus on getting the right people in the right seats based on these indicators of adaptability, rather than getting stuck in your mindset of what the resume of an ‘ideal candidate’ looks like.” As long as your training for a specific role is sufficiently robust, you can groom the right candidate to be everything you need. Get out of the machines’ way. Automation does not mean going from solely human to solely machine-based work; we need to stop treating it as a binary choice. This requires a mindset shift, in which leaders and team members alike look at automation as a supplementation rather than a replacement. The workplace of the future may not be as bleak as prognosticators would like you to believe, but it is still imperative to keep up with the times. By adequately arming your employees with the tools and training they need to succeed, you can create a stronger working environment where humans and machines exist harmoniously side by side, for the benefit of all. 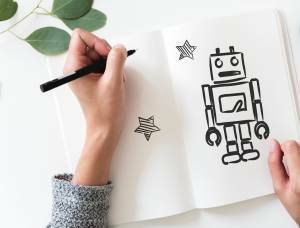 replaced by machines, no matter how smart and versatile they might be,” says Inge Oosterhuis, managing director of talent and organizatio for resources at Accenture. Bringing in automated services can help increase employee productivity by speeding up mundane tasks and freeing up workers to focus on providing insights that will drive the company forward. Part of marrying human- and machine-based work is providing the means for your employees to learn new technical, interpersonal, and diagnostic skills. Addressing the skills gap requires new methods of employee training, and your employees know it: 54 percent of them believe ongoing training and skill development will be absolutely necessary throughout their careers as workplaces evolve.